Craig Laughlin gives instructions to a group of students. So, I’m not sure whether I should start this off with Craig Laughlin‘s apparent love for Macy’s or the fact that he and Peter Bondra, and few other former Caps are hanging out at the Gardens Ice House in Laurel, Md. this summer. My gut is telling me, “Go with the hockey!” so here it is. After about a decade at Piney Orchard, the move to replace locker rooms with a daycare area forced the Network Hockey Development Program to move to Laurel. There, Laughlin and his team of coaches, former participants (including his son, Kyle) and Capitals alumni continue their quest to produce not only great hockey players, but also great people. While most hockey camps and programs offer the chance for on-ice improvement, Network Hockey is focused on the journey to becoming a better person. Mottos such as “Developing lives: body, mind, and soul” and “Get better, get worse, or stay the same” speak to the program’s purpose as it is combined with a familial atmosphere to allow the players to mature within the system, extending even beyond the summertime. Aside from Laughlin and Bondra, Laughlin said that Bruce Boudreau is scheduled to attend this summer, as well as former Caps Alan May, Trent Whitfield, and Mark Tinordi. Jarred, Tinordi’s son and a product of the program, was drafted 22nd overall by the Montreal Canadiens last year. He spent this past season with the Ontario Hockey League’s London Knights. 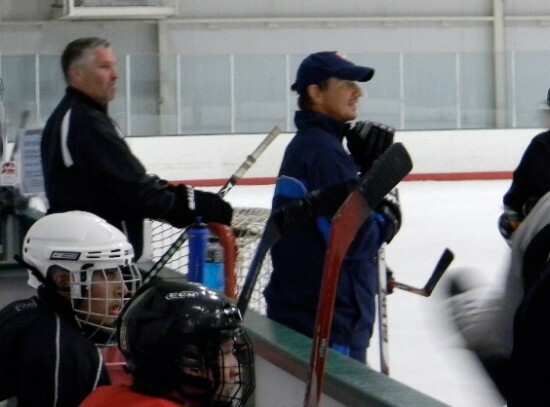 Craig Laughlin and Peter Bondra observe the Network Hockey students. Laughlin and the instructors maintain personal contact with the players, never afraid to offer the required criticisms and let them know the reality of where their future lies. Families involved reinforce those bonds, billeting players from out of state, Laughlin included. The program, which started with seven kids, including Laughlin’s own, has seen about 700 pass through since its inception about a decade ago, with more interest growing as with the Caps. In that span it has become one of the North America’s premier programs due to Laughlin’s original desire to provide a better experience for his own children when he played and spent summers in the D.C. area. This is all going on despite Laughlin’s own health issues. It seems that years of hockey have caught up to him, and he’s going to be getting double hip surgery in August. Is he concerned? Laughlin laughed it off. “Six weeks, I’ll be fine,” he said, anxious to once again participate in Capitals alumni games. Despite that, he still skates out with his students to lead drills. But back to the Macy’s thing. After the interview, I mentioned that I work at Macy’s. That lit Laughlin up like a July 4th firework. He’s likely been too busy to shop but it’s made me a whole lot more excited about going to work.